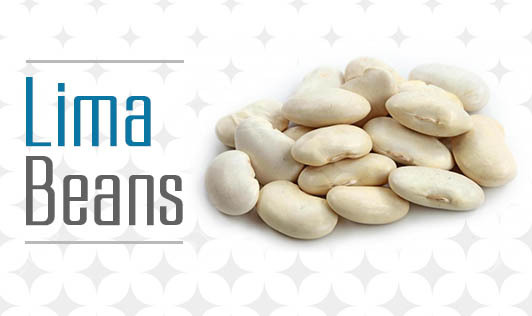 Lima beans are small green coloured beans, available fresh, dried, canned, frozen or even roasted. These are a rich source of energy, proteins, vitamins, minerals and antioxidants. It also contains an appreciable amount of fiber that maintains good colon health, aids in reduction of blood cholesterol levels (by re-absorbing bile from the colon), and acts as a laxative. Lima beans also contain a large percentage of plant sterols which also decrease blood cholesterol. Most B-complex vitamins like B1, B2, B3, and B6 in lima beans aid in metabolism of the macronutrients in the body. Folate is also present in good amounts in lima beans, which along with vitamin B12, is required for DNA formation and cell division. Hence especially during pregnancy and for vegetarians, this is extremely important. Minerals like copper, iron, manganese, and molybdenum with all these nutrients, render lima beans as a rich nutrient store house.